image © 2001 Orlando Nelson Grillo. All rights reserved. Flying reptiles became extinct about the same time that dinosaurs did, at the close of the Age of Reptiles, or the Mesozoic Era, 65 million years ago. Even as they reached new records of size, a changing geography and their failure to adapt to new environments doomed pterosaurs. The Inland Sea, which covered so much of the interior of North America, drained away, and similar events around the globe affected the climate and food supply. Birds were better suited to flight and adapting for survival in almost every way, and became increasingly diversified. 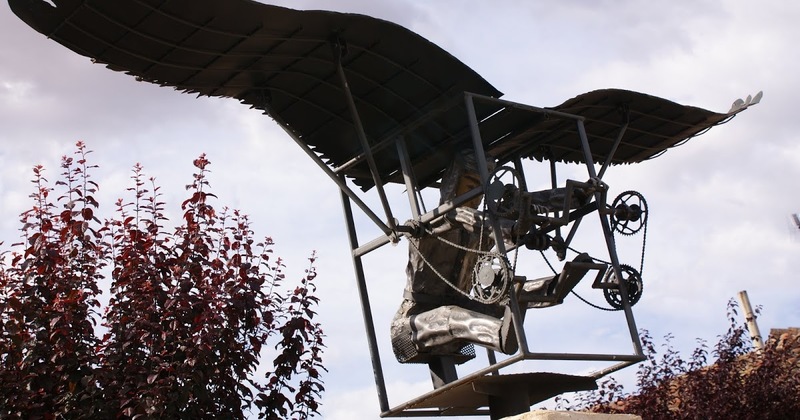 Flying reptiles have captured the popular imagination ever since Arthur Conan Doyle made them part of his science fiction story The Lost World. Scientists named them “flying lizards” or pterosaurs (TERA sores), nearly two centuries ago, when their fossil remains were first found. How such large animals could actually fly has long been a scientific puzzle, since they weighed about as much as a human being. Today’s hang-glider pilots must solve the problem of getting themselves airborne by using other aircraft, or leaping from great heights. How a giant lizard would take off is an unanswered question. 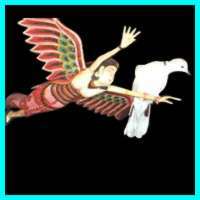 The flying reptile was called “one of the greatest freaks of all time” by the late Harvard professor Percy Raymond. The flight mechanism was bat-like rather than bird-like. A membrane of skin stretched from the trunk to the front limb, but was attached to a greatly elongated fourth finger of the hand, and not to all four fingers as with a bat. Flying reptiles were probably soarers and gliders rather than active flyers. They could fold their wings like bats, and may have had similar roosting habits. Until recently, it was thought that a wingspan of about 24 feet was the maximum size, for one of these winged lizards. Then in 1971, Douglas Lawson, a University of Texas student, discovered the fossil bones of an even larger specimen, with a wingspan of 36 to 39 feet. It was named after the Aztec god who looked like a feathered serpent: Quetzalcoatlus northropi. Pronounced “kwet zel KWAT lus,” this creature was one of the last of the pterosaurs to survive. Its neck was extremely long, its slender jaws were toothless, and its head was topped by a long bony crest. Like other pterosaurs, it had fingers on the front edge of its wing with sharp claws that could grip prey. The eating habits of Quetzalcoatlus are unknown, and there are different theories about the feeding habits of flying reptiles. Some experts think they ventured far out to sea, skimming over the surface of the water, and skillfully fed on fish. Others think they may have been carrion feeders, like modern vultures, and fed upon the carcasses of dinosaurs. Their long beaks and necks made them capable of probing deeply for food, on sea or land. 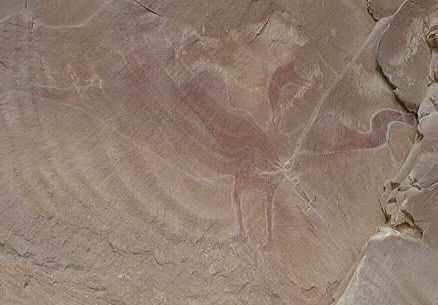 Aeronautical engineers and paleontologists have theories about how large animals launched themselves into space and stayed there. 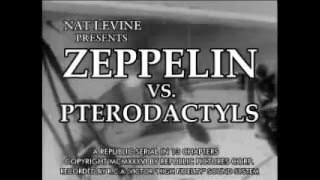 As a flying machine Quetzalcoatlus lacked the muscle power to run rapidly until it reached an airspeed that allowed it to take off. Likewise, it did not have the muscle or skeletal structure to flap its wings constantly to maintain flight. Perhaps it became airborne by dropping from the height of a cliff, or the crest of a wave. Or perhaps it waited until the hot sun warmed the ground and created strong thermal updrafts. Maybe it could stand up on its hind legs and catch an appropriate breeze, and with a single flap of its wings and a kick of its feet become airborne. Once aloft, it may have stayed in the air for long periods, riding air currents with minimal effort as it soared slowly and gracefully over land or water looking for prey. Its aeronautical design suggests that it could coast more slowly than a bird, before it stalled and had to land. The great wings may have allowed it to land gently, but its size, weight and long, weak hind limbs suggest that it did not live in trees as birds do. Flying reptiles became extinct about the same time that dinosaurs did, at the close of the Age of Reptiles, or the Mesozoic Era. Even as they reached new records of size, a changing geography and their failure to adapt to new environments doomed pterosaurs. The Inland Sea, which covered so much of the interior of North America, drained away, and similar events around the globe affected the climate and food supply. Birds were better suited to flight and adapting for survival in almost every way, and became increasingly diversified. THE LEGEND: Does The Cloud Dragon Live On? Policeman Arturo Padilla of San Benito, Texas, was driving his police cruiser through the wee hours of the morning in 1976 when something unusual appeared in his headlights. It looked like a big bird. Only a few minutes later fellow officer Homer Galvan reported it too. A black silhouette that glided through the air. According to Galvan it moved without ever flapping it's wings. A short time later Alverico Guajardo, a resident of Brownsville, Texas, reported he'd heard a thumping noise outside his mobile home at about nine-thirty at night. When he looked out the door he saw a monstrous bird standing in his yard. "It's like a bird, but it's not a bird," he said. "That animal is not from this world." Sightings of the big bird multiplied. A radio station offered a reward for the creature's capture. A television station broadcast a picture of an alleged bird track. It was some twelve inches long. The Texas Parks and Wildlife Department, concerned that hunters might mistake a large rare and protected bird, like a whooping crane, for this creature announced that, "All birds are protected by state or federal law." In February 1976 several school teachers told of a large flying creature, at least 12 foot across, diving at their cars as they drove to work. One of them checked the school library and found a name for the animal: A Pterosaur. Pterosaurs were an order of reptiles that lived, and went extinct, with the dinosaurs. They were the first true flying animals with vertebrates. Their wings were composed of a membrane of skin that stretched from the side of the body, along the arm, out to the tip of an enormously elongated fourth finger, and then back to the ankle. Computer analysis of pterosaur fossils suggest that they were slow gliders capable of making very tight airborne turns. 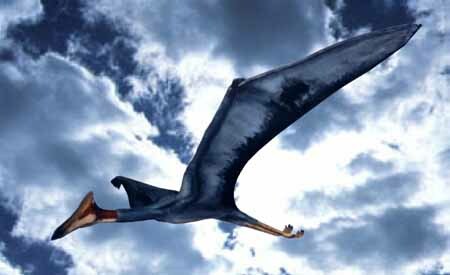 A large Pteranodon, with a wingspan of 30 feet could turn, in mid-flight, in a circle only 34 feet in diameter. The largest known Pterosaur (indeed the largest known flying animal of all time), the Quetzalcoatlus, had a wingspan of 50 feet (larger than that of many small planes) and weighed about 190 pounds. Unlike many of the other Pterosaurs Quetzalcoatlus lived inland and probably had a vulture-like existence. It's long neck would have helped it to "probe" dinosaur carcasses for meat. Quetzalcoatlus, interestingly enough, brings us back to Texas. 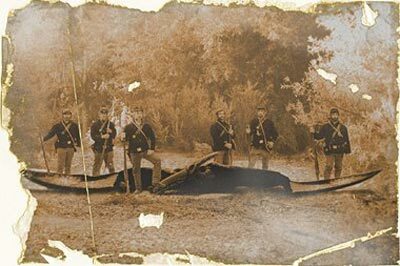 The first Quetzalcoatlus fossils were discovered in Big Bend National Park, Texas, in 1972, just four years before the first sightings of the Texas "Big Bird." Is there a connection? 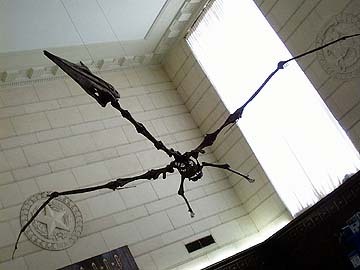 Have there been Pterosaurs hiding in Texas for the last 65 million years? Or could it be the publicity surrounding the discovery of Quetzalcoatlus four years before triggered the misidentification of normal large birds like the sandhill crane, brown pelican or the vulture? We may never know, because after the two month flap of sightings in 1976, reports of the big birds dwindled. The Pterosaurs, if they ever existed, have gone back into hiding. THE ABOVE ARTICLE: Copyright Lee Krystek 1996. All Rights Reserved. Above (from Padian 1985): A generalized pterosaur wing (hum= humerus, r= radius, u= ulna, mc= metacarpus, pt= pteroid, c= carpus, I-IV= numbered digits). 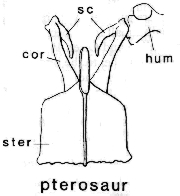 Also pictured: A generalized pterosaur pectoral girdle (sc= scapula, cor= coracoid, hum= humerus, ster= sternum). The pterosaur wing (shown above) was supported by an elongated fourth digit (that is, like on a hand, a "pinky finger" several feet long). Pterosaurs had other morphological adaptations for flight, such as a keeled sternum (shown above) for the attachment of flight muscles, a short and stout humerus (the first arm bone), and hollow but strong limb and skull bones. 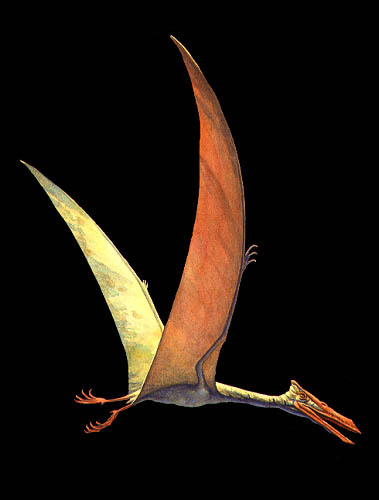 Pterosaurs also had modified scales that were wing-supporting fibers, and that possibly formed hairlike structures to provide insulation -- bird feathers are analogous to the wing fibers of pterosaurs, and both are thought to possibly have been evolved originally for the primary purpose of thermoregulation (which implies, but does not prove, that both pterosaurs and the earliest birds were endothermic). Pterosaurs also had a bone unique to their clade. It is called the pteroid bone, and it pointed from the pterosaur's wrist towards the shoulder, supporting part of the wing membrane. Such a novel structure is rare among vertebrates, and noteworthy; new bones are unusual structures to evolve -- evolution usually co-opts bones from old functions and structures to new functions and structures rather than "reinventing the wheel". The wing membrane of pterosaurs most likely did not include the hindlimbs; there is no evidence for the existence of such a membrane, but if such a membrane were to exist, a gliding origin for pterosaur flight would probably be more feasible. For an interesting comparison in wing design and flight adaption between the elongated fourth finger approach used by the pterosaurs and the feathered bird-wing structure used by the twenty-five foot wingspan Teratorn please visit: Wing of the Giant Bird.